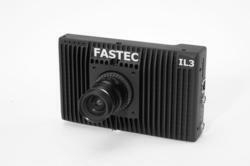 Following in the footsteps of the handheld TS3 camera line, Fastec has developed the IL3, a high-speed camera with ease of use as its main inspiration. The IL3 captures crisp, clear high-speed imagery, and it offers an intuitive image data workflow, ideal for laboratory and industrial environments. Matt Kearney, Vice President of Sales and Marketing at Fastec Imaging, explains the company’s unique take on improving the high-speed imaging workflow for the user. “High-speed cameras acquire compelling images that are both fascinating and enlightening, but setup and use of these cameras is often complicated and time consuming. With the IL3, we are taking the tedium out of high-speed imaging. This camera is truly intuitive to operate, using many of the technologies that surround us every day.” The IL3’s ample features may be accessed over Gigabit Ethernet via Fastec’s FasMotion software on your PC or via the camera’s built-in web interface with your favorite web browser on your PC, Mac, tablet or even your smartphone. “Our goal is to provide a high-speed camera that can be readily controlled by whatever is already in your briefcase or your pocket,” says Kearney. The IL3 also offers a solution to the most difficult issue associated with high-speed imaging: how to deal with the massive amount of image data created by the camera. “High-speed cameras capture more image data in minutes than conventional digital video cameras capture in hours. Minimizing downtime, while transferring large volumes of imagery from camera to PC or other media, is a challenge. With the IL3 camera system, we are meeting that challenge head-on,” offers Kearney. “By implementing hardware accelerated Gigabit Ethernet image transfer and offering built-in solid state hard drives, we are able to move data much faster than traditional high-speed cameras. We significantly reduce downtime and increase productivity for the system and its operator.” The standard IL3 features full Gigabit connectivity and both USB and SD card ports for quick and easy image downloads to USB flash drives, SDHC SD cards, or portable USB hard drives. Fastec offers the IL3 in three models. The IL3 100-S provides 1280 x 1024 resolution at over 500 frames per second (fps), and recording rates in excess of 98,000 fps at reduced resolutions. For applications where slightly lower resolutions or frame rates are sufficient and lower cost is a priority, the IL3 100-L (800 x 600 max and 1250 fps max) and IL3 100-LS (1280 x 1024 max and 500 fps max) are ideally suited. Fastec Imaging is a global manufacturer of digital high-speed imaging systems. The company specializes in uniquely portable and affordable high speed camera systems, including handheld, point-and-shoot systems, compact PC-controlled cameras and long duration record systems. Fastec cameras are used in myriad applications, including engineering, industrial manufacturing, packaging, medical and academic research, bio-mechanics, military range testing, sports performance and broadcast entertainment.